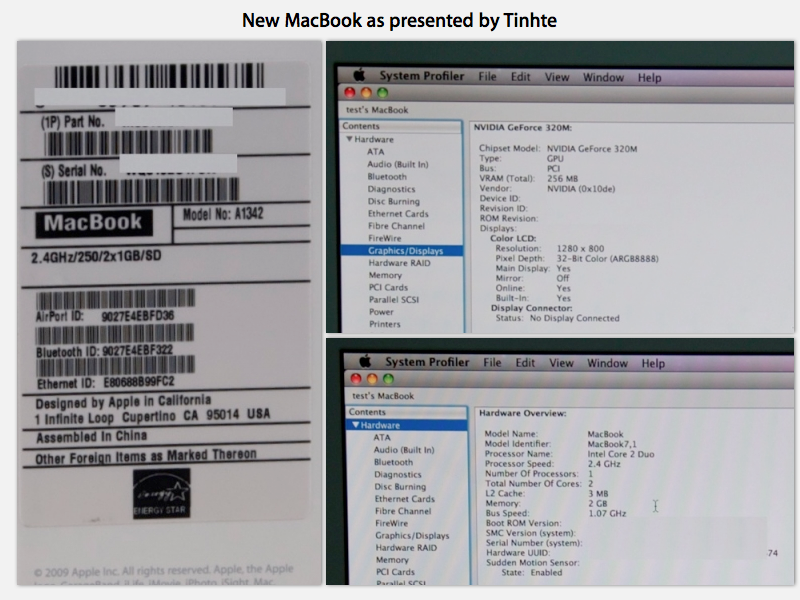 The new MacBook was obtained by Tinte, the same website that also got their hands on a prototype of Apple's next-generation iPhone this week. The new MacBook (identified as model MacBook7,1) uses a 2.4GHz Core 2 Duo, up from the existing 2.26GHz model. It also gets the same Nvidia GeForce 320M graphics with 256MB of DDR3 SDRAM as the MacBook Pro. That's an update from the existing GeForce 9400M of the "MacBook6,1" entry level white MacBook. The new model also gets the improved, streamlined MagSafe connector as the latest MacBook Pro models, which points the adapter cord backward rather than perpendicular from the body. It has the same 1280x800 pixel widescreen display, a 250GB 5400 RPM hard drive, and 2GB of 1066MHz DDR3 SDRAM from the previous MacBook update. AppleInsider published an in-depth review of the latest MacBook Pros released last month detailing the CPU and graphics changes that now appear to be making their way into the entry level MacBook.